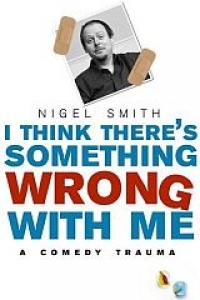 On the 15th November 2001, Nigel Smith was rushed to hospital with a brain lesion so big the radiologist thought the scan had been taken post-mortem. In the months that followed, there were times when Nigel wished it had been. He’d never needed a life-shattering illness to teach him that he should have spent more time smelling the roses. During his glittering careers as a journalist (sacked), busker (bottled off), TV producer (sacked twice), TV writer (show axed) he’d smelled more of them than Alan Titchmarsh. He seemed to be one of those lucky blokes who always got away with it. He’d landed a lovely woman who looked like Debbie Harry, he’d inherited her lovely kids, he’d got a nice house and car, acquired more than one pair of nice trousers and he and his missus were about to have their first baby. And although he’d just been sacked again, he felt there were plenty more roses out there, right? I Think There’s Something Wrong With Me is Nigel’s unflinchingly honest, moving yet hilariously funny account of this terrifying experience and his recuperation – from his time in hospital and the months in intensive care to the slow journey back to some kind of normality in a rehab unit where his behaviour was likened to that of Jack Nicholson (The Shining Jack, not the ‘Cuckoo’s Nest’ one). Then he went and sacked himself from the unit to be at the birth of his daughter. She’s called Scarlett. After the captain. The one who’s indestructible. Like her bloody dad. Funny, fearless and surprisingly touching. The funniest book about nearly dying I've ever read. And I've read them all.